Revolutionary activists have long been protesting against the Islamic State of Iraq and Sham (ISIS), known locally as Daesh, the main Al Qaeda affiliated group in Syria. Comprised mainly of foreign militant jihadi fighters, ISIS has focused on consolidating its control over large parts of territory primarily in the north of the country rather than fighting on the front lines or coordinating with armed opposition groups. It has established Islamic emirates in areas under its control implementing a strict interpretation of Sharia law, alien to the vast majority of the local population, and assaulting the rights of women and minorities including dictating women’s dress and attacking churches. The group has also been responsible for carrying out brutal attacks against civilians, public executions and sectarian killings. Over recent months ISIS has carried out assaults on Free Syrian Army (FSA) positions and kidnapped and executed FSA commanders. It has also targeted civil opposition activists, particularly media activists, leading to raids of offices and arrests in Raqqa, Aleppo and most recently the heart of the revolution; Kafranbel. In ISIS detention centers torture, floggings and summary executions are common. Rejecting this group, its ideology and practices, protesters regularly chant slogans at demonstrations saying “ISIS and the regime are one” or “Daesh leave”. Women have played an important role in these protests, such as the stand against ISIS in Al Raqqa by brave revolutionary Suad Nofal which inspired other women to protest across the country. Conversely, when the regime has carried out onslaughts against Raqqa and Aleppo, its attacks have been on civilian (mainly working class) neighbourhoods and not on ISIS positions or headquarters. The ISIS headquarters in Al Raqqa are stationed in the largest building in the city so they are not difficult to miss, but instead regime airstrikes target schools killing students. ISIS has acted as a scapegoat for the regime’s attack on a popular uprising. Assad’s prisons are full of secular, civilian, non-violent activists whilst Al Qaeda affiliated prisoners were released in the early days of the revolution. In recent days protests against ISIS have escalated even occurring in areas where the group has limited, if any, presence such as Damascus suburbs and Deraa in the south. 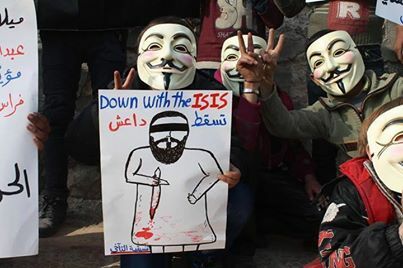 On 3 January civilians across the country took to the streets to condemn ISIS’s authoritarian practices and reactionary ideology as well as the recent torture and murder of Ahrar Al Sham commander Dr. Hussein Al Suleiman (known as Abu Rayyan). Protests have continued this week  and activists are now calling for a ‘Day of Rage’ on 10 January against Al Qaeda in Syria and the regime. This is ‘the revolution within the revolution’ and a clear testimony from the Syrian people that Daesh does not represent them. On the military front a full scale war is also being waged against ISIS. On 3 January groups affiliated to the Free Syrian Army as well as the newly formed Islamic Front and Jaysh Al Mujahidiin started to engage in fierce battles with ISIS, driving out the group from many strongholds in the north, and capturing a large number of ISIS fighters. As of 7 January, twitter reports from activists suggested that ISIS had been driven out of 10 locations in Aleppo, 6 locations in Idlib, 3 in Deir Al Zour and 1 in Hama. Some areas liberated from ISIS, such as Manbej and Binnish have been subjected to fierce shelling by the Assad regime following rebel takeover, leading in the case of Binnish to ISIS being able to retake the town and increasing speculation of military coordination between ISIS and the regime. ISIS has shown it is not leaving without a fight, committing a massacre against FSA troops in Rastan. On 6 January ISIS executed 50 prisoners it was holding in detention in Aleppo including women and activists as well as executing detainees in Harem, Idlib before pulling out of the area. There are also concerns that ISIS withdrawal from some areas, whilst bringing in reinforcements from elsewhere, may be indicative that they are now preparing a counteroffensive. The battle against ISIS may not yet be won, but it signals a turning point in the revolution as the military wing has joined civilian activists in demanding that ISIS leaves. Yet, the defeat of ISIS does not mean the defeat of all groups that share Al Qaeda’s ideology as groups such as Jabhat Al Nusra are not currently under military attack and have even been promoted as an example ISIS should follow by Hassan Aboud, the leader of the Islamic Front. The tolerance of Jabhat Al Nusra has been due to it having more Syrian members and currently not interfering with other armed opposition groups or with pluralistic civil governance structures, and not harassing civilians to the extent ISIS has done, instead focusing its energy on opposition to the regime. There has however been strong opposition to Jabhat Al Nusra from civil activists who have long seen it as a counter-revolutionary force. The recently formed Islamic Front, a coalition of eleven mainly Salafist brigades, whilst not an Al Qaeda group and seen as part of the armed opposition to the Syrian regime, is also giving concern to some revolutionary activists. The group’s ideology is only marginally different from ISIS. It is supported by the reactionary Gulf monarchies and wants to establish an Islamic State based on a puritanical interpretation of Islam which would lead to a retrogression in the rights of minorities and women. Some of its members (including its military chief Zahran Alloush) have engaged in sectarian discourse including calling for cleansing Syria of Shia and Alawites. It’s ideology is certainly a far cry from from the demands of the overwhelmingly secular civil opposition, the backbone of the revolution, that have been calling for a civil, democratic state for all of Syria’s citizens regardless of ethnicity, sect or gender. Ghayath Naisse is correct to suggest that that the Islamic Front’s attack on ISIS may be more about challenging a competitor, rather than in defense of the original goals of the revolution. It is likely that most fighters are drawn to the Islamic Front because it has access to the military assistance and foreign support that has been denied to the Free Syrian Army rather than shared ideology. Undoubtedly, the formation of the Islamic Front and unification of large and powerful military brigades can bring about a military advantage in the fight against Assad. But winning the battle against the regime (and Al Qaeda) is not the same as achieving the goals of the revolution. The Syrian people’s struggle against tyranny and for freedom, dignity and social justice continues.